If CO2 emissions do not fall fast enough, then CO2 will have to be removed from the atmosphere to limit global warming. Not only could planting new forests and biomass contribute to this, but new technologies for artificial photosynthesis as well. Physicists have estimated how much surface area such solutions would require. Although artificial photosynthesis could bind CO2 more efficiently than the natural model, huge investments into research are needed to upscale the technology. After several years during which global emissions stagnated, they rose again somewhat in 2017 and 2018. Germany has also clearly missed its climate targets. In order to keep global warming below 2 degrees Celsius, only about 1100 gigatonnes of CO2 may be released into the atmosphere by 2050. And In order to limit global warming to 1.5 degrees, only just under 400 gigatonnes of CO2 may be emitted worldwide. By 2050, emissions will have to fall to zero. Currently however, 42 gigatonnes of CO2 are added every year. The Intergovernmental Panel on Climate Change (IPCC) has numerically simulated various scenarios. Only in the most optimistic scenario can the climate target still be achieved: and this by means of immediate and drastic measures in all sectors (transport, agriculture, construction, energy, etc.). In the less optimistic scenarios, the global community will have to take additional measures beginning in 2030 or by 2050 at the latest: we will have to implement "negative emissions" by removing large quantities of CO2 from the atmosphere and store them permanently in order to balance the carbon budget. One example of negative emissions is large-scale forestation—forests bind CO2 in wood as long as it is not later used as fuel. 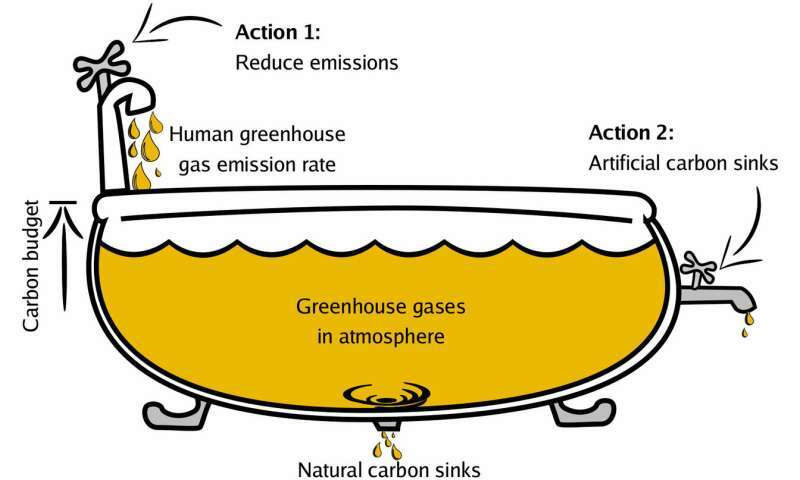 But CO2 could also be removed from the atmosphere and bound using artificial photosynthesis. In a median scenario, at least 10 gigatonnes of CO2 per year would have to be removed from the atmosphere beginning around 2050 to balance the climate carbon budget. Forestation and cultivation of biomass for reducing CO2 compete for the same areas as are needed for agriculture, however. With just more biomass alone, it is therefore difficult to reach this scale, for natural photosynthesis is not a particularly efficient process. Leaves are able to use a maximum of two per cent of the light for converting CO2 and water into new chemical compounds. The two physicists argue that in order to bind 10 gigatonnes of CO2 per year in the forest, about 10 million square kilometres of the fertile areas on Earth would have to be planted with new forest. This corresponds to the area of continental Europe...up to the Urals!. Materials systems currently being researched for artificial photosynthesis might bind CO2 with considerably greater efficiency. Already today, on a lab scale, photo-electrochemical systems made of semiconductor materials and oxides can utilise about 19% of the light to split water, for example, and thus realize part of the photosynthesis process. However, the material system envisaged by May and Rehfeld is not about producing hydrogen with sunlight, but instead about binding CO2 molecules and converting them into stable chemical compounds. "However, this is a relatively similar problem from the point of view of physical chemistry", says May. The prerequisite, however, is that it will be possible by 2050 to develop large-scale, durable modules that use solar energy to convert atmospheric CO2 into other compounds. The required area for this solution can be calculated. Assuming efficiency of 19% and 50% system losses, around 30,000 square-kilometres of modules may be sufficient to extract 10 gigatonnes of CO2 from the atmosphere annually. This corresponds to the approximate area of the German federal State of Brandenburg. "These kinds of modules could be placed in non-agricultural regions—in deserts, for example. In contrast to plants, they require hardly any water to operate, and their efficiency does not suffer when exposed to intense solar radiation," explains May. The extracted CO2 could be converted to formic acid, alcohol or oxalate and combined with other compounds (such as calcium chloride) to form solid minerals that can be stored or even used in the form of plastic as a building material. "It might be possible to develop such modules, but even if we could then build them, we estimate that the conversion will cost at least 65 euros per tonne of CO2. The extraction of 10 gigatonnes of CO2 thus results in costs of 650 billion euros each year. Moreover, negative emissions can only be the last resort to slow dramatic climate developments. The best thing now would be to drastically reduce emissions immediately—that would be safer and much cheaper," says May. They keep saying the cost is too high. No, it would just be invested differently from current practice, and it would lead to higher overall economic growth (entire new sectors of economy--think of the space race and all that came from it), but those who currently profit would get a smaller share. Probably more dollars, actually, but smaller percentage. Unacceptable!